Grades 6 and up. Younger if shared with an adult. Mulder is an avid cyclist who does not own a car. 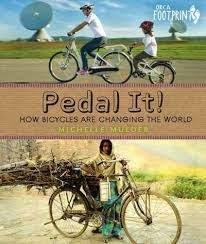 In this book she traces not only the invention of the bicycle, but takes readers around the world to see the many different ways bikes are used for work and play. Mulder divides the book into four chapters and lavishly illustrates it with many well-captioned photographs and engravings showing different types of bicycles and their many uses. There is a photo of a man who lives in Ho Chi Minh City, Vietnam who is a riding pet shop, complete with plastic bags of live goldfish attached to a frame on his bike. There are many sidebars which highlight bicycle facts and how bikes have impacted people’s lives. Take ‘The Baker on the Bike’. Mulder’s friend Claudio bought a cargo tricycle and built a box for the front to carry his freshly baked bread to the farmers’ market. Imagine riding a bike with the scent of freshly baked bread surrounding you! The writing is accessible and reflects Mulder’s passion for how bikes can have a positive impact on our world is evident. Back matter includes resources and index. Fiction titles that would complement Pedal It! include Shift by Jennifer Bradbury (a teen suspense story), Crunch by Leslie Connor, and The Bicycle Man by Allen Say. The answer to whether bikes can power computers, sharpen knives or perform lab tests is True.